LOWELL — Heaven knows political farce is not hard to find, especially at a time when primary voters in one of our two major parties have proven curiously willing to reward a certain candidate’s nonstop buffoonery and fact-free diet with frontrunner status. But political farce that’s actually funny? Ah, that’s a much scarcer commodity. 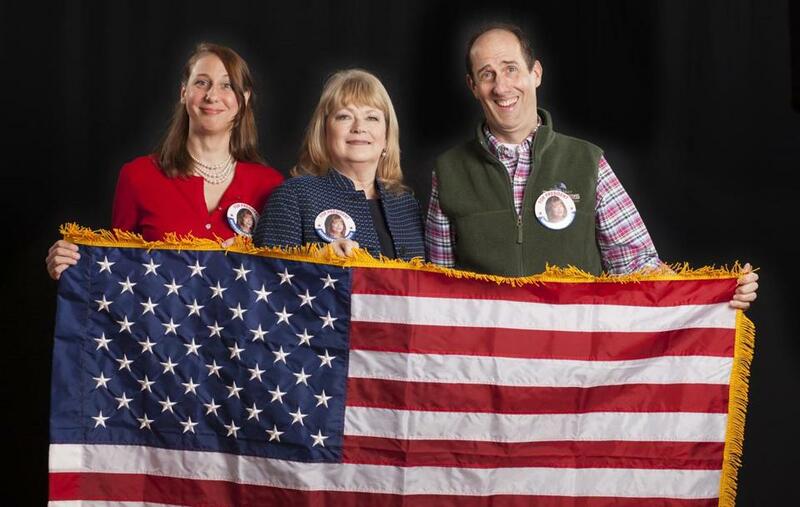 Which brings me to Lila Rose Kaplan’s irresistibly entertaining “Home of the Brave,’’ now receiving its world premiere at Merrimack Repertory Theatre. I’m happy to report that while its subject is presidential politics, “Home of the Brave’’ does not have a serious bone in its loose-limbed body. Do not see this play in search of brow-furrowing insight; it has none. “Home of the Brave’’ is unapologetically broad and blessedly devoid of message, meaning, or moral. Kaplan, a Cambridge playwright (“The Light Princess,’’ “Wildflower’’), simply sets out to make you laugh, and that she does, often. In achieving that worthy goal, Kaplan has an astute and nimble accomplice in Sean Daniels, who pulls out all the stops at the helm of the Merrimack Rep production while putting a vivid exclamation point on the end of his ambitious first season as the company’s artistic director. The production is loaded with physical comedy, sight gags, amusing musical punctuation, and non sequiturs that, in context, acquire a certain skewed logic. Like Robert Brustein’s “Exposed,’’ presented recently by the Boston Center for American Performance and Boston Playwrights’ Theatre, “Home of the Brave’’ was inspired by Moliere’s “Tartuffe.’’ Kaplan’s play also bears faint traces of HBO’s “Veep,’’ starring Julia Louis-Dreyfus as a female vice president-turned-president, though “Home of the Brave’’ has no interest in drawing “Veep’’-like blood. Karen MacDonald stars as Bernadette Spence, a newly minted US senator from Iowa — she holds the seat formerly occupied by her revered mother — who is cajoled into running for president by a mysterious British adviser. In “Home of the Brave,’’ MacDonald is in excellent comic form as Bernadette, conveying both the senator’s steel will and her paradoxical malleability, along with an inability to resist the siren song of the highest office in the land. When the time comes to impersonate a horse and hide behind a haystack in the family’s barn (the first-rate scenic design is by Randall Parsons), MacDonald proves up to those challenges, too. But the revelation of this production is John Gregorio. Portraying Adrian, the political adviser, Gregorio oozes mustachioed pseudo-suavity and guile in a manner that both Peter Sellers and Mephistopheles would have admired. Executing verbal and physical pirouettes with equal virtuosity, the actor is simply a treat to watch. As are the rest of the cast, which includes Joel Van Liew as Bernadette’s nebbishy husband, Owen, a veterinarian who is on the threshold of a major career opportunity that might be complicated by his wife’s presidential candidacy, and Veronika Duerr as their high-strung daughter Marianne. But “Home of the Brave’’ ultimately pivots upon the dance of temptation and ambition between Adrian and Bernadette, the Svengali and the senator. Possessed of unexplained powers and offering wildly inconsistent accounts of his background, Adrian strives to keep Bernadette in the dark about his true motives as he stealthily maneuvers her toward an announcement of her presidential candidacy on Christmas Day. Along the way, the adviser admonishes Bernadette to “be more warm, less factual’’ and more “like a real Mum’’ while dispensing nuggets of campaign wisdom like this one: “Nobody likes a fact, but everybody likes a cookie.’’ Somewhere, Hillary Clinton is gritting her teeth.